Few performers can convey the electric victory and sweeping heartbreak of life like Meryl Streep can, even from the stands after approximately half a beer. 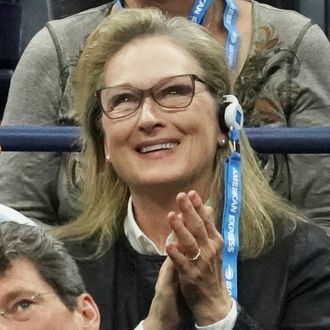 Tennis fans everywhere, tuning in to see Novak Djokovic and Juan Martín del Potro square off in this year’s U.S. Open men’s singles final, also got the added thrill of Meryl emoting in the crowd, giving nothing less than her best as Djokovic played toward victory. The moment Streep realized the announcers were both talking about and watching her, and saluted them with a Heineken Light, probably isn’t eligible for an Emmy, but honestly, give it a few years.